‘Exciting times’ are on the way for people in Hartlepool according to councillors – with key town buildings highlighted for further regeneration to build on projects so far. 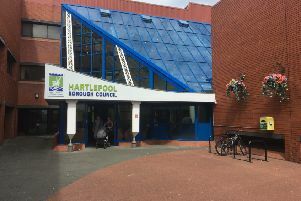 Hartlepool Borough Council’s regeneration services committee discussed the ongoing regeneration that has been taking place in the town, with £45million secured in external funding in recent years. Projects include the regenerations of the Church Street and Waterfront sites, the arrival of the RML 497 ship and the Western Growth Corridor development. Potential ideas for future developments raised by councillors include the redevelopment of offerings at the the Borough Hall in Headland and the Town Hall Theatre in Raby Road. Coun Rob Cook said: “The likes of the Town Hall Theatre and the Borough Hall, two big spaces there that we do use to a point, but not fully. “Our assets we’ve got in this town, we need to make better use of. The Borough Hall, Hartlepool. Picture: Google. “There’s obviously a lot of money to be spent in some of these areas but there’s also the facilities that are here, there’s the possibility of bringing a lot of revenue back into the town. “We’ve always punched above our weight, but since the governance change in 2010, we’ve done even more than just punch above our weight. “All the staff down to the people working outside on the front line, they all want a pat on the back. The Waterfront plans for Hartlepool. Coun Shane Moore said: “It’s something we vitally need to do. The Borough Hall used to see regular boxing and events going on there that were televised through Sky TV. Councillors praised the existing regeneration taking place in the town, with external funding supporting projects such as the redevelopment of the former post office to The BIS centre and the Seaton Carew regeneration. Coun Kevin Cranney said: “This service and every service area has gone through radical restructuring and changes to be leaner and meaner due to austerity. “What we’ve done, we’ve improved the support and growth of business, we’ve improved the town’s infrastructure, we’ve improved the skills and employment of residents. Coun Jim Lindridge said: “It’s a pity we couldn’t lose five or ten years of our life and project ourselves forward. Denise Ogden, director of regeneration and neighbourhood services, further praised officers for work carried out despite austerity.